Look at me! I’m “bouldering” in the area where you can climb without ropes. It may look innocent and perhaps not that exciting, but let me tell you, it’s challenging, and totally fun. We were having such a good time we weren’t really focused on how much we were pushing ourselves. Definitely a good workout while playing and having a good time. I so wish we had one of these places locally so that we could go regularly. 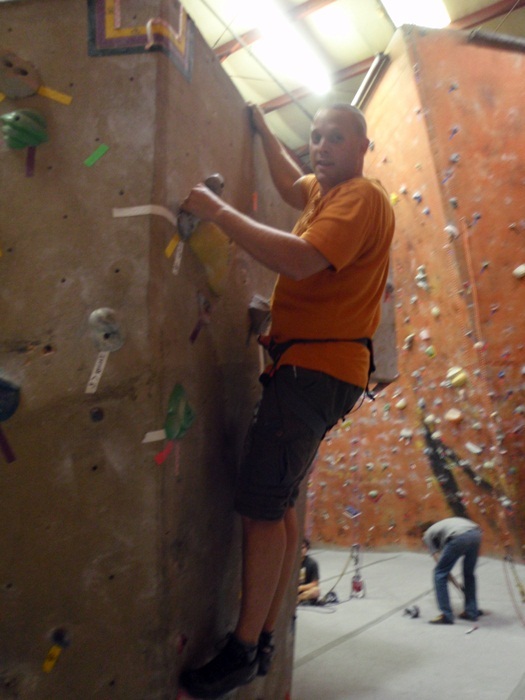 Here I’m taking on one of the more challenging walls. 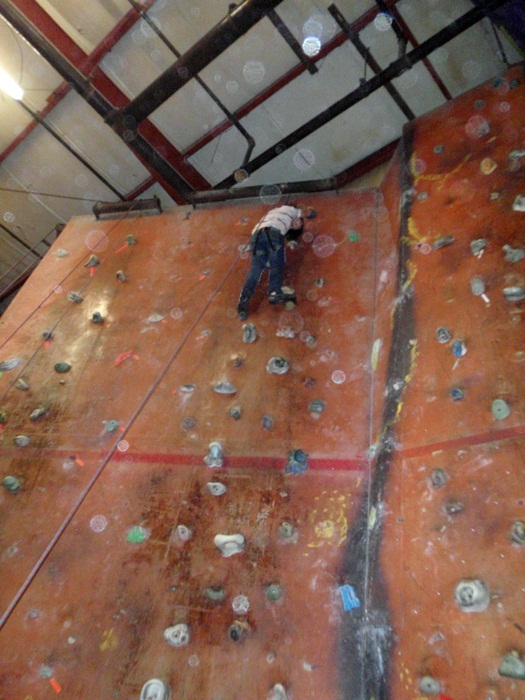 I was not able to make it to the top on this one due to the pitch higher up but I was pleased I got as far as I did. They have walls that pitched away from you for kids and beginners, walls that are vertical, walls that start out vertical and then pitch toward you halfway up (that’s what I’m on now), and then uber advanced walls that pitch toward you so much you’re upside down before you go vertical. 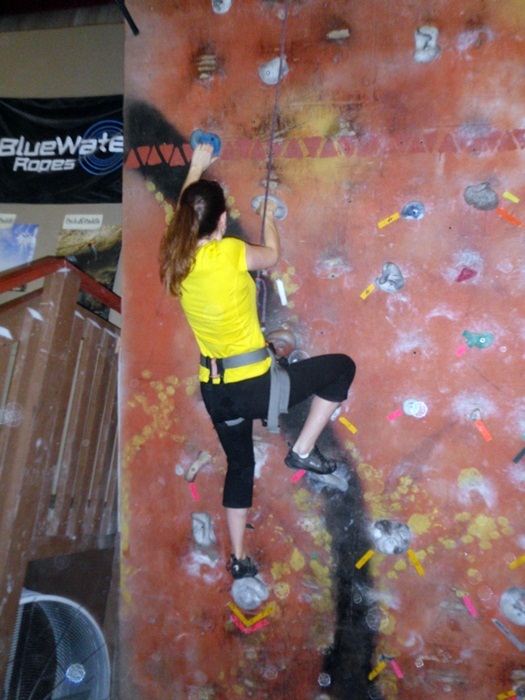 They also have some mostly vertical walls with much smaller grips and toe holds that are for the more advanced user. Here’s Don at the top of one of the more vertical walls. It might not seem that high but it is. I wouldn’t even go to the top on my very first try. I got nervous about the height. But by my second wall I got over that. 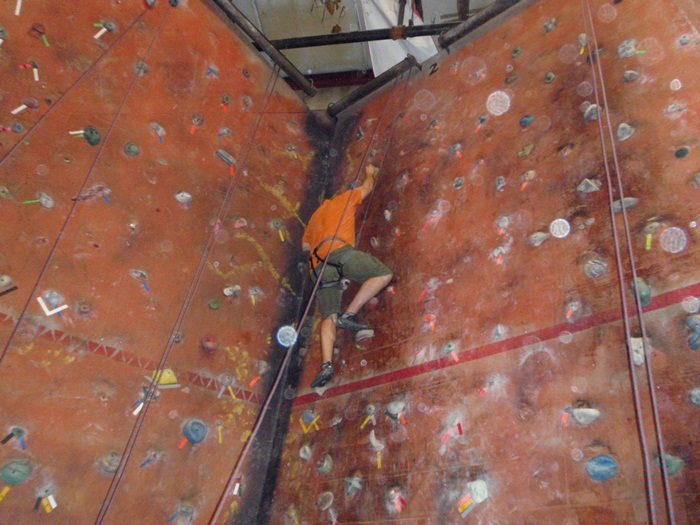 Every climber has to have someone spotting them below, it’s called belaying. Don is belaying for Claire. You can just see part of him in front of my blindingly yellow shirt. 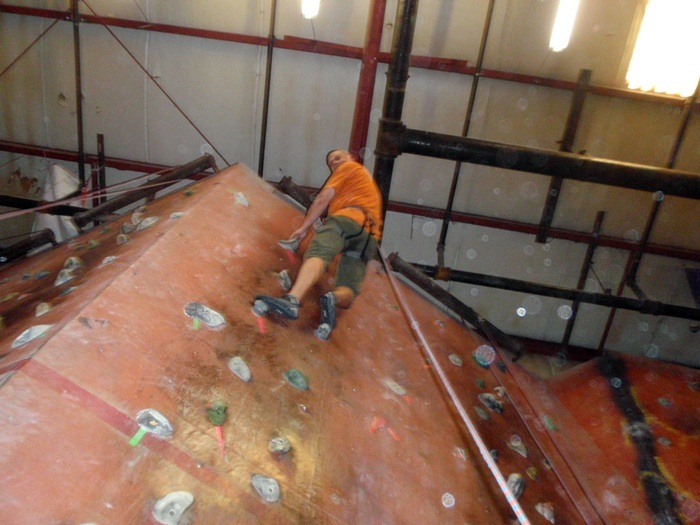 When the climber gets to the top, they let go with their hands, lean back in the harness and the belayer lowers them back to the ground. 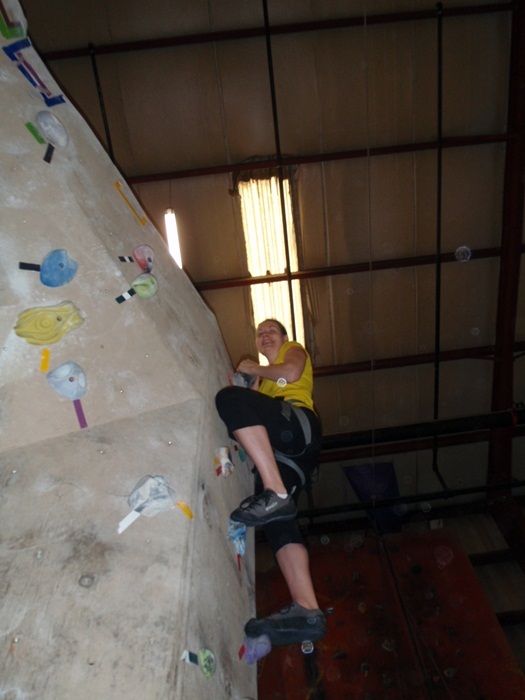 Even belaying was hard work in my opinion. At least when belaying for each other; the kids hardly weighed anything so they were pretty easy to belay. 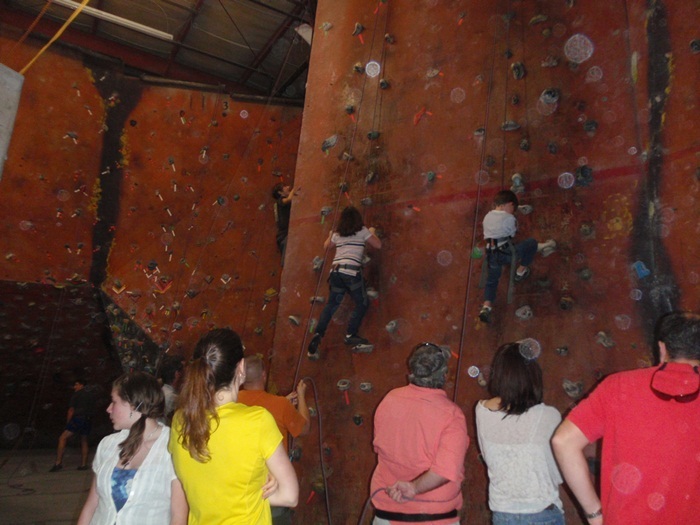 That’s Olivia making it to the top, after much encouragement, on the wall just to the right of the one Claire was just on. And there’s Claire at the top of the same wall. We were so proud of those two! Don’s taking on another wall that’s more vertical with some smaller grips. Made it to the top! 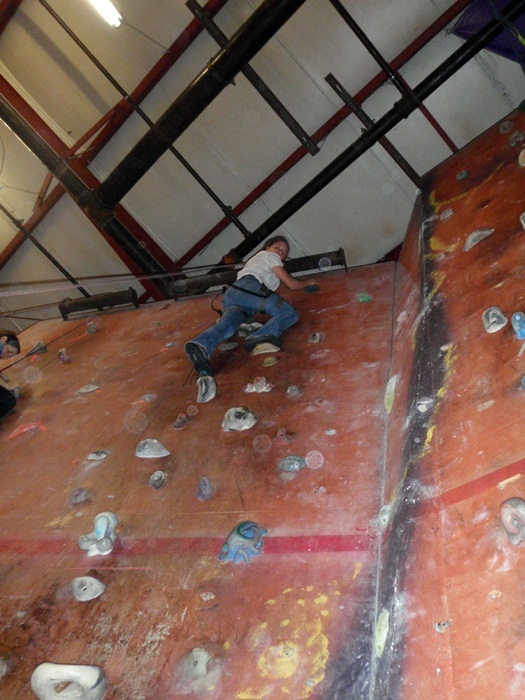 The red line you keep seeing in the pictures is where bouldering is allowed without ropes. There were some folks that looked like regulars there with their own chalk climbing those lower areas. This was my last climb. 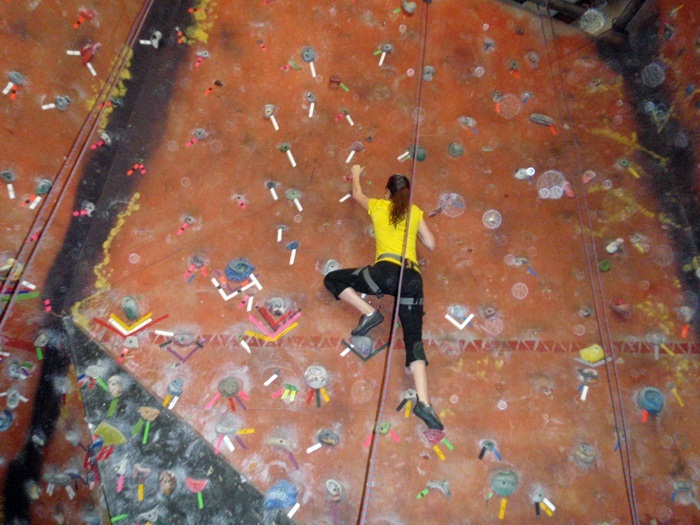 This wall was definitely the most challenging wall that I conquered. I think I might have done it two times all the way to the top, and a handful of unsuccessful attempts at first. You couldn’t go straight up on this one. I finally found a way up starting to the right of where I’m at and moving left as you go up, then straight up from where I’m at. After this climb my arms were shaking and it was time to call it quits – after about 3 and 1/2 hours of playing. So, how do we feel today? Not too bad. I am usually the most sore on the second day after a hard workout so I’m curious to see if I’ll be hurting tomorrow. But so far, not too beat up for how much strength it took to climb. I would totally suggest to anyone whose even slightly interested to try this someday. It’s so much fun. I don’t think you’ll catch us out on a mountainside climbing, we don’t have the urge for that. But indoor play is happily welcomed.